FILE - Chinese tourists queue outside the Galeries Lafayette general store in Paris, France, Wednesday, Aug. 26, 2015. In an online statement Sunday, the tourist organization said it is studying relevant punishment measures for Chinese tourists who sign what it called "fake contracts" with travel agencies for bargain trips. Each of the tourists on the tour reportedly paid 300 yuan (US$47) for a three-day tour and shopping marathon in Hong Kong. “To some extent, crime has been committed in two areas. The first is that those people who [have] sold discount trips below the cost, that is in China,” said Andrew Chan, an associate professor at the Hong Kong Polytechnic University's school of hotel and tourism management. 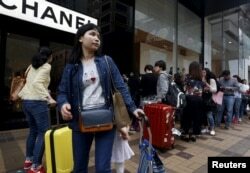 FILE - Mainland Chinese visitors wait outside a luxury store at a shopping district in Hong Kong. Chinese authorities have been threatening to revoke licenses or impose fines of up to 300,000 Chinese yuan (US$47,300) on travel agencies that lure tourists with unreasonably low fees that are below the cost and later forced them to shop in designated stores. But so far, the practice remains rampant even though "free" trips are banned in China. The only area where authorities appear to be making some inroads is when tours are advertised online. In early March this year, two online travel agencies "turiu.com" and "ly.com" were ordered to cancel a promotional tour that cost participants only 1 Chinese yuan (US$0.16). “China is such a big country. [It’s hard already for] orders [from Beijing] to be followed through in local provincial governments or governments of third- or fourth-tier cities. Their execution just isn't thorough,” she said. It takes huge efforts and manpower to monitor such illegal practices and in places where there is no supervision, tour operators struggling with thin margins will still tend to take risks, she added. Zeng agrees that tourists should be held liable if they fail to spend a pre-agreed amount of time at shops as stated in the contract and itinerary. But a clear line should be drawn when tourists are locked up and forced to buy, which should definitely be considered a crime, she added. Joseph Tung, executive director of the Travel Industry Council of Hong Kong, also welcomed the Chinese regulator’s move. Hong Kong Polytechnic University’s Chan disagreed. He said that if punishments are imposed on tourists, it is likely to backfire. “Even though they are beaten up by those salespeople in Hong Kong, they will not complain, because they understand, if they complain, and then [when] they go back to China, they will be criminalized. So, I don’t think this is reasonable and fair at all,” Chan said.